After waiting nearly a year for this act, I came away feeling a little disappointed. There are just too many disparate plot threads vying for attention in Act III, and ultimately none of them are given enough room to breathe. I also found the tone and message overly bleak. The first two acts of the game (especially the second) seemed to argue in favor of the preservation of space. The third ascribes a grim inevitability to the deterioration and repurposing of space: Fighting it is futile. For example, take Xanadu, the supercomputer you come across. For Donald, its creator, it’s the ultimate act of preservation. It’s a catalog of better times spent with his former colleagues. It’s almost a literal memory bank. And yet it’s presented as some sort of weird, ridiculous fool’s errand. For Conway and his gang, Xanadu is just a means to an end. They’re not interested in the substance of the memory, just the information contained therein. They strip-mine the memory for its facts, ignoring whatever deeper meaning it might have held for Donald. And ultimately, players are more on Conway’s side than Donald’s. They just met Donald. They think he’s an eccentric weirdo. They, like Conway, just want to get on with it. That’s really the problem with Act III. It doesn’t make the player want to empathize with anyone. It’s more interested in portraying their connections to their memories as strange and disturbing. (See also: Conway’s memories of Lysette’s dead son; Shannon’s memories of her mother and the bird cage.) I find it odd that a game whose first two acts poured a lot of effort into making players feel warmth and empathy for the characters and setting would then turn around and make them feel discomfort and possibly even revulsion. I’m not sure I agree with your interpretation of Xanadu. I think it’s perhaps even more bleak than you [believe]. 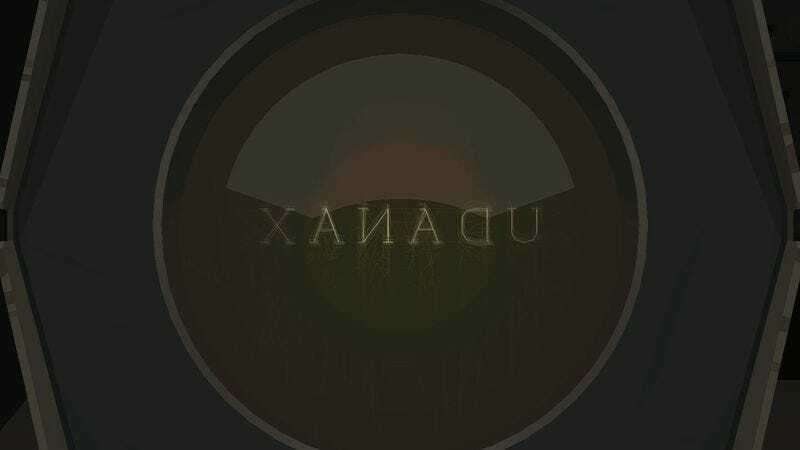 I took it that Xanadu was created not as a repository of memory but as a simulation. It just so happens that the simulation necessarily runs the exact same way as life and the game’s story did. Donald didn’t program that to happen, it’s just inevitable. I agree that this has been the bleakest of the three acts. It starts off on a bit of a high note (that performance!) and then becomes darker and more dour. There’s the caves, the bonfire at the heart of the mountain, the sinking into the earth underneath the church. Lots of hell imagery all around. I found interacting with Xanadu a frustrating exercise (probably by the creators’ intention), and I think it comes down to the idea that Xanadu is an attempt to recapture what was lost and can never be recreated. I think they’re riffing off of the idea of someone clinging to the past so intensely that they get drowned in it. I hadn’t thought about Lokimotive’s point while playing, but it really resonates with me as someone who has studied graphics programming. The idea of perfectly simulating the world you live in through computers (which really struck me when talking to the grad student character about perfecting Xanadu’s caves and playing its weird little academia simulation game) has always been something of a holy grail. Let’s come up with new and exciting ways of simulating light particles! The game was asking, “What’s the point of all that? What does it get us?” Its own answers are on the cynical side. Now that I think about it some more, Xanadu also becomes a bit of an intertextual snipe at other video games, especially of the sandboxy Grand Theft Auto variety, the kind that are constantly boasting of their ever increasingly complex simulations of “real” life. You’re right about the strength of Burial’s humanization of Elizabeth. My problem with it is that it also tried to fix some of the mess it made with Columbia, and that’s where things fell apart. Bad enough that it tries to tie together the Songbird and the Big Daddies and Vigors and plasmids (I’m pretty sure things won’t quite hold up if you examine the timeline under a microscope, but frankly, I don’t care that much) but its attempt to rescue Daisy Fitzroy’s character was a disaster. She started out as a populist, justifiably angry. She was quickly turned into a “meet the new boss, same as the old boss” destructive force. Then, she jumps off the slippery slope into full-on “kill ’em all” mode by almost killing Fink’s son. In Burial, we find out that Fitzroy was instructed to pull that final stunt by the Luteces so that Elizabeth would kill her and become the strong woman who could go on to eradicate Comstock. I agree with you. Trying to redeem Daisy after the fact was stupid and narratively inferior to her portrayal in Infinite. However, if you look at it more thematically (and this is backed up by all of Daisy’s audio recordings found around Burial At Sea), they’re using Daisy to foreshadow the same sacrifice Elizabeth is going to make at the end of Burial. Daisy gave her life for her cause, so her people could be free. Elizabeth gave her life so Rapture could be overthrown, Fontaine eventually killed, and all the Little Sisters to be free. It’s also worth noting that all the stuff she pulls in Burial, like manipulating the last Comstock into his own death scenario and unleashing an army of rebellious working-class convicts and homicidal junkies into Rapture, wouldn’t have been possible if Elizabeth hadn’t opened the door to her dark side by first murdering Daisy. It actually doesn’t take much. You’re allowed one harvest while still getting the good ending. Two or more, and you get the bad ending. Kill all of them, and you get the same bad ending with the voiceover that’s read in a slightly angrier voice. The dual endings are still the weakest part of the original story. They really need a proper middle ground, a “sad” ending that’s neither good nor bad. Or even better, there could be a more thoughtful mechanism for choosing the ending. It seems to me that redemption is a strong theme in the game—the idea of “a man chooses” meaning the choice to be someone different than who you have been. This plays out with Tenenbaum: she created the little sisters, originally with cold, scientific intent. Then, she grows to care for and protect them. During my first playthrough, a similar thing happened to me. At first, they seemed like monsters, and Atlas seemed pretty persuasive. I harvested two or three. Once I saved one and heard their little “thank you!” I didn’t have the heart to harvest any more. So I was virtuous through the rest of the game, especially after the bit where you wake up in the nursery. But it was too late. I had already doomed myself to the bad ending by the second level. There was no room for character growth or redemption, and so the ending cutscene rang completely false and out of left field when I got there. Perhaps if the number you harvested didn’t count as much as when you harvested them, the outcome would better line up with the player’s personal story. And with that, another Gameological week comes to a close. Thanks for reading and commenting, everybody. We’ll see you next week!